“Bubblegum Princess” is a story about a little girl who learns to be herself. And how by doing so, she changes the kingdom’s perception of the innate gifts that make her unique. The story begins with Katy, our heroine, who delights in blowing bubblegum bubbles – a decidedly unladylike habit. But, despite formidable opposition, she teaches the kingdom to love bubblegum bubbles as much as she does. “Bubblegum Princess” is loosely based on the fantastical real life romance of the Duke and Duchess of Cambridge, otherwise known as Prince William and Duchess Kate Middleton. Joey Pinkney: Where did you get the inspiration to write “Bubblegum Princess”? Julie Gribble: I read an article about the passing out (graduation) parade at Sandhurst in 2006, where Kate Middleton’s mom got into a spot of trouble when she was seen chewing gum in public. Rumor had it, the Queen was very upset, and forbade Will to see Kate – this was just a rumor of course, fueled by the possibility that Will and Kate did stop seeing each other briefly within the year. Anyhow, I thought it silly, but wondered what if bubblegum chewing was outlawed? Then I suppose all bubblegum bubble blowers would be banished. So how would one un-banish oneself? Or perhaps the question was, how would one change the Queen’s perception of bubblegum bubble blowing? Which is what our heroine ends up doing! JP: What sets “Bubblegum Princess” apart from other books in the same genre? JG: We created a dummy book of “Bubblegum Princess” far before publication to get feedback from librarians, educators, parents and children. It was wonderful to hear what elements were working and what weren’t. For example, we decided to keep some of the advanced, fun tongue-tying language after a few parents told us these words sparked a conversation about vocabulary with their children; they all felt a sense of accomplishment when their kids learned these new words, particularly the few advanced ones. Very impressive! 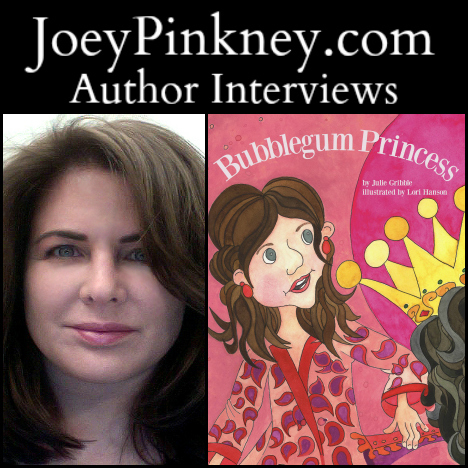 JP: As an author, what are the keys to your success that led to “Bubblegum Princess” getting out to the public? JG: We’re still developing our platform, so help thus far has come from friends, professional associates and family spreading the word. We’ve had stellar reviews, which certainly helps! I developed a six page marketing plan, long before “Bubblegum Princess” was released, but I’d implement some elements of the marketing plan earlier next time. The book gained attention when it was released on the day the Royal Baby was born and this helped get the book mentioned in the LA Times! I highly recommend joining SCBWI and if you’re self publishing, most definitely join IBPA – they’ve incredible resources for independent publishers. JP: As an author, what is your writing process? How long did it take you to start and finish “Bubblegum Princess”? JG: For“Bubblegum Princess” I started with an outline, just a few lines for each page. This helped determine how many illustrations were needed. Then I listened to classical music to create a formal rhythm and classic cadence – that’s when the fun really started. I had a good time with language and finding the right voice for this story. I didn’t know what it was truly about until the very last revision, when everything clicked, and the theme became crystal clear. The true test for me is if the story makes me feel something – if I giggle in the right places and feel weepy in the right places – then I know it’s done. JP: What’s next for Julie Gribble? JG: I’m a Southampton Children’s Literature Fellow, studying with Emma Walton Hamilton and Cindy Kane – I couldn’t be happier being mentored by such heavy hitters in the world of children’s literature. I’ve completed two more stories, with two more scheduled to be competed by December. And I’ve over a dozen new story ideas to keep me busy during the spring!